I will definitely check out these other blogs! They all sound very interesting and informative. 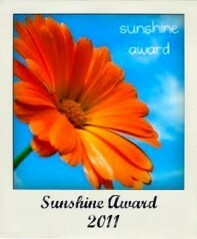 And thank you so very much for the award and mention! You’re welcome. I especially loved your answer of wild violets…there’s nothing more beautiful when they fill a whole field. Oh I know it is a dream come true when they fill the whole field!! Thanks for the nominee, much appreciated and will post about it asap. Sorry you had a posting problem. I get them from time to time where the screen cycles back and forth between signing in and what not, never saves your post. And no, “Blogger” is not the only offender. Saw your e-mail so I’ll post your message. Good to know that your blog doesn’t hate me! Congratulations on your award! My mother in law loves canadian geese too. I think they’re supposed to symbolise friendship or something. Thanks so much for passing it on to me! I really do love your blog! Keep up all your fantastically interesting posts! Um…you? Every time I check back in on your blog you get another follower! You never cease to amaze me. By the way, I am really enjoying Infinite Devotion, Lauren! 🙂 I just finished the life during the Renaissance in Italy. I was captivated!! You’ve made my day, Sara!